Got it! Works great! Nice crisp improvement in the SVTF’s shifting abilities. I acquired mine from NorthCoast Performance (very nice folks to deal with) for $84.95 + $5.00 shipping and handling. It’s actually the Ford Racing Performance Parts shifter, which others have noted, is the same unit as the Steeda. I decided to put together another one for the short shifter. that the removal of the stock shifter and components is the hardest part. For this reason, the concentration of this write up will fOCUS on the removal process. which also appears to be a “bone of contention” with previous installers. 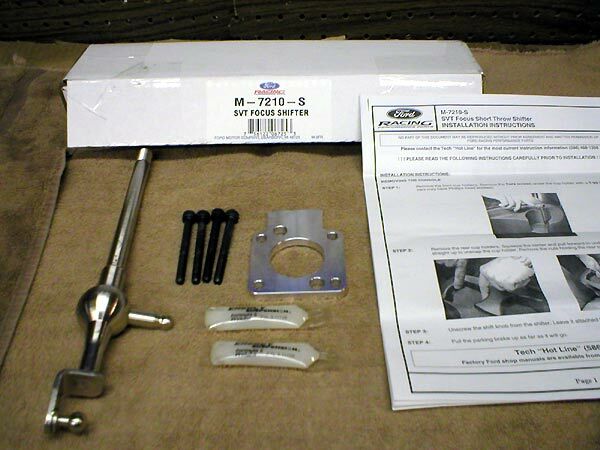 Here’s the FRPP (Steeda) short shifter kit. Last edited by WD40; 10-08-2004 at 05:36 PM. Here’s the before (left) and after (right) pic showing the difference in the shifters. These are all the tools I utilized for the removal and installation. Missing in the pic, is the 3/8 to 1/4 drive adapter for the Torx bit. Last edited by WD40; 10-09-2004 at 12:03 PM. With that…..on with the STS install. Have a cup of coffee. This is going to be LONG. Note: You’ll see I used the word gently several times. If you have to force it, take a deep breath, and come back to it in a little more relaxed manner. while with your right hand, gently push in and pry up with a screwdriver. Pull the boot up and over the shifter. There’s no need to remove it completely. Last edited by WD40; 10-08-2004 at 05:39 PM. 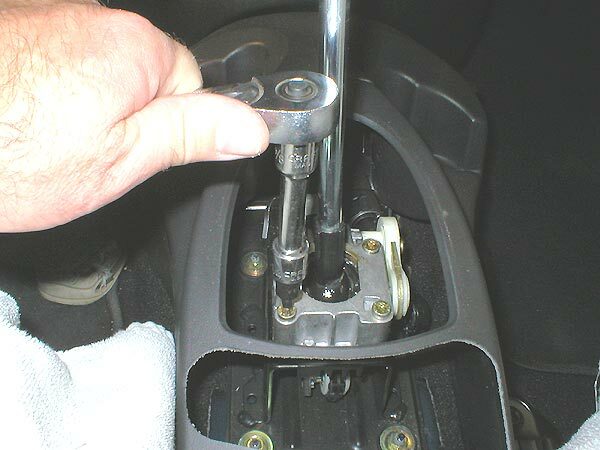 Using a 17mm open end wrench, unscrew the shift knob. You’ll see there’s “flats” for this purpose cast into the base of the knob. Pull it up at the front first, till it unsnaps from the console, then grab both sides at the back, and pull up. Remove the 3 connectors for the seat warmers and traction control if so equipped. You can see by the pic, that you squeeze on the top portion, and pull out from the sockets. 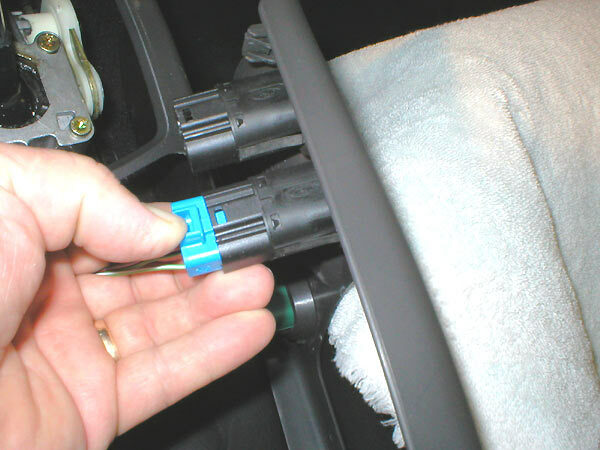 All 3 connectors have unique fitments, so there’s no worries of getting them confused upon reinstallation. Place the shifter in 1st gear. 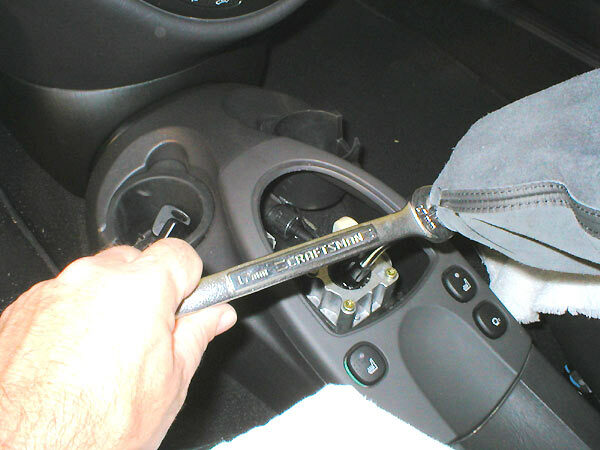 Remove the inner cable directly underneath the shifter by gently prying it off with a screwdriver. 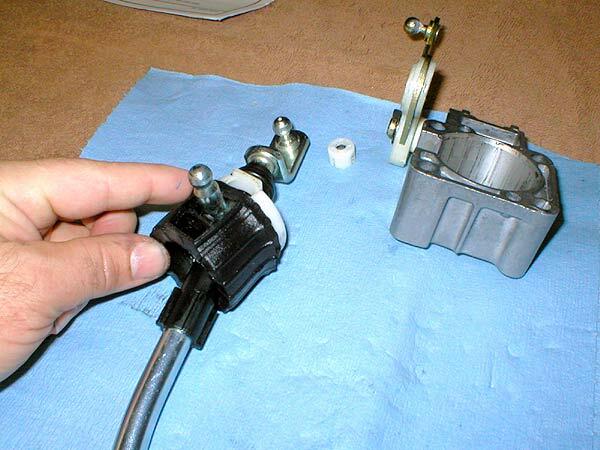 Use the same method to remove the outboard shift cable. 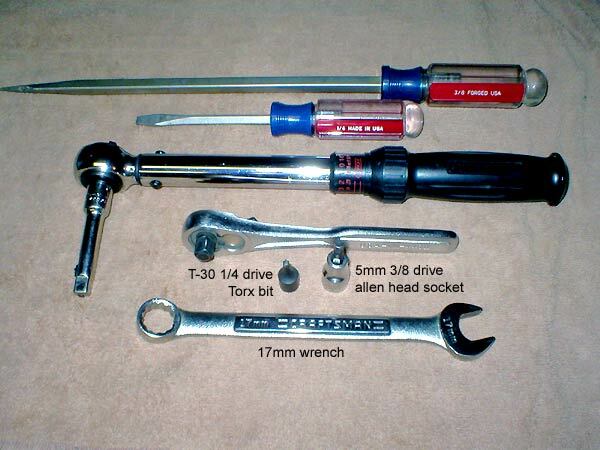 Use a T-30 bit and a 3/8 drive ratchet. Firmly press down as you break the bolts loose, then turn them out. They will be hard at first, as LocTite was used to secure them. I broke them all loose first, then turned them out in a criss-cross pattern, as you would with wheel lug nuts. 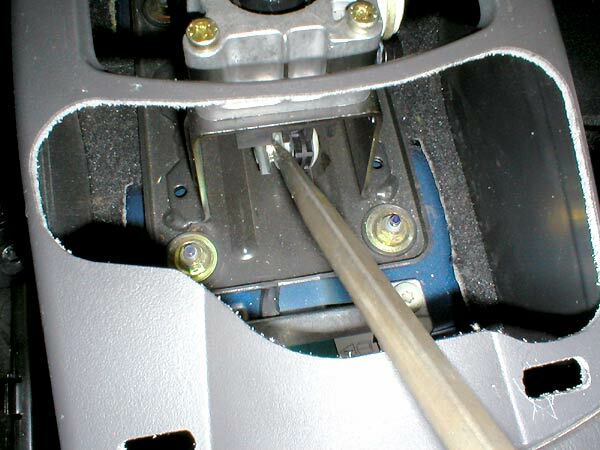 Once all the bolts are removed, carefully extract the shifter taking care not to catch the cables. 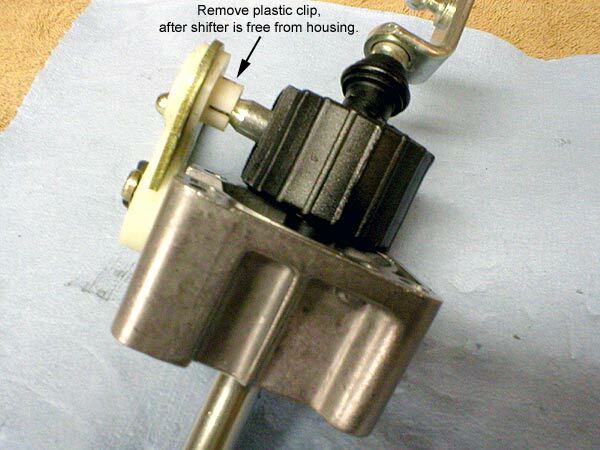 Now, set up a nice clean area on your work bench to work on the shifter itself. Have some rags handy, because your hands will get greasy. 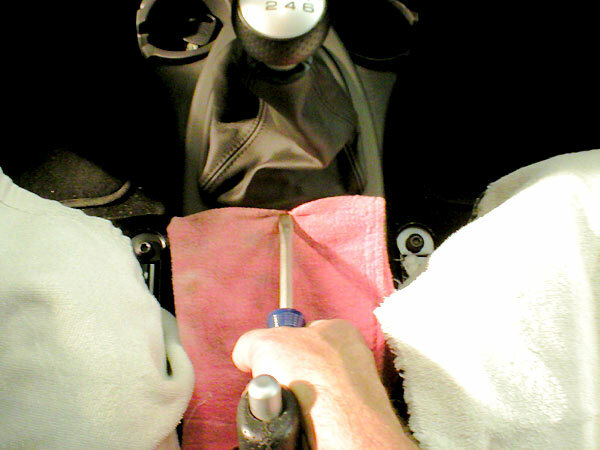 Push the shifter out and to the right as shown, and then remove the plastic clip by gently pulling it off. Remove the rubber sheath by pulling it off over the pivot cup. Remove the plastic white half of the pivot cup.